(Newser) – Police in Calgary are investigating a horrifying find made when a mall maintenance worker tried to fix a toilet in a women's bathroom that wouldn't flush. "If you were to look at the toilet, there's a panel behind it so that when people move, it would automatically flush," says police spokeswoman Emma Poole. "When they removed that panel, they found a deceased person behind that wall." 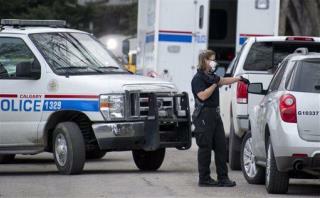 Police say the body is that of an adult male, though no identity or cause of death has been determined, the CBC reports. The grisly find was made Monday morning at the Core Shopping Center, the main shopping complex in the Alberta city's downtown. If he was a transient, then likely, no one missed him. If he wasn't, then did no one miss him? Time to scroll through all of those missing person posters. My money is on 20th victim of rental driver. He was hit and FLEW through the air till he landed in the wall. Although Calgary, could have been one of those olympic ski jumpers. Is Iran or Cuba missing any?